After ending "First Great Migrations" Slavic, Baltic, Germanic, and Iranic tribes stayed near the places of their primordial habitats. Further study ethnogenesis of these peoples requires application of the graphic-analytical method again. Using this method for the Germanic and Baltic languages is problematic because of their small number, so we need to start with Iranic or Slavic. We know that the ancient Iranic parent language was subdivided into a large number of higher-order languages. Proto-Slavic was dismembered to somewhat smaller number. However greater similarity of Slavic languages gives us a reason to believe that the separation of Proto-Slavic language to dialects occurred later than the formation of the Iranic languages (originally dialects). Therefore, following the chronology, it is necessary to begin with Iranic. Specialists believe that the Iranian common language, or "base language", at some time differentiated into two main dialect groups conventionally called "western" and "eastern". The main features of this division are some historical and phonetic features of their consonantism. The Median, Parthian, Baluchi, Kurdish, Talyshi, Persian, Tajik, Tatic and other language originated from the western dialects, the eastern dialects gave rise to the Sogdian, Khorezm, Pashto, Ossetian, Pamir languages etc. (ORANSKI I.M., 1979: 88). Ignoring such division, we will examine Iranian languages using the graphic-analytical method and see how obtained results correspond to the accepted differentiation. The Iranic language family include near 40 modern (Ibid: 17). Among them are such as individual Ossetian (with Digor and Iron dialects}, Yaghnobi, Pashto (with dialect of Wanetsi), Yazghulami, Kurdish (with Zazaki, Kurmanji, Sorani, and Gorani dialects), Baluchi, Gilaki, Mazandarani, Sarikoli, Paracha, Ormuri, the language of Semnan. Other languages are combined into groups. These are Talyshi with close to it Tatic (the Tatish language could be added to them too) , dialects of Persian-Tajik (Farsi, Khuzestani, Bandari, Quhistani, Hazaragi et al. ), the minor languages of Central Iran (Raji), Luri and Bakhtiari dialects, dialects of Southern Iran (Bashkardi, Kumzari et al. ), Pamir languages, including Shugni-Rushan and Ishkashim-Wakhi language groups. In addition, there were still the language of the Avesta, Bactrian, Parthian, Sogdian and Saki-Khotanese languages and languages or dialects, not mentioned in historical sources, what can be indicated by linguistic analysis of the texts of the Avesta and ancient Persian language. This map is based on work by Dr. of Columbian University Michael Izady (the original is here) . The history of the overwhelming majority of the Iranian languages cannot be traced due to the lack or inadequacy of written monuments and that some languages still remain non-literate. We can talk surely about the development of the Persian language, whose history can be traced back to the VI c. BC, about its close connection to Tajiki, as well about the continuation of the Sogdian language in modern Yaghnobi. Even the question of a dialectological base of the Avesta language has no clear answer (Ibid: 33). On the other hand, for many centuries the Persian language has had a great influence on other Iranian languages and Persian borrowings are often forced out ancestral words of unwritten languages which are lost forever. We have… to put up with the inevitable gaps explained by failure known material of a language (eg, lack of fixing words in the texts of the extinct languages, the lack of dictionaries of some living languages and dialects), or the loss of a word in any language by replacing its by an innovative word or borrowing (EDELMAN D.I. 2005: 8). In addition to the Etymological Dictionary of Iranian languages were used the Historic-etymological dictionary of Ossetic (ABAEV V.I., 1958-1989), Etymological Vocabulary of Pashto (MORGENSTIERNE GEORG VALENTIN, 1927) and bilingual dictionaries of the following languages: Ossetic, Kurdish, Talishi, Gilaki, Persian, Pashto, Tadjik, Dari, Yazgulami, Shughni, Roshani (with Khufi), Bartangi, Yaghnobi, Sarikoli (Tashkorgani). The artificial Dari language was created on the basis of Persian and Tadzhik, and the latter evolved from Persian therefore all these three languages can be considered as the unity. Also Shughni, Roshani and Bartangi had the common parent language. They were united into one group of the Pamir languages. Perhaps the second group of the Pamir languages is constituted by the Wakhi and Ishkashimi languages which vocabularies were not studied because of absence of dictionaries. In total 1776 phono-semantic sets were included into the study. 281 of them were considered as common Iranic words. Then the table-dictionary was composed and the number of mutual words in the language pairs was calculated. The result of the calculation is given in table 6. 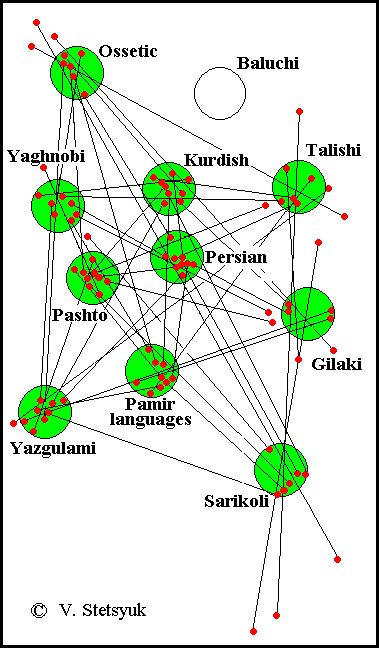 While preparing the relationship model of the Iranic languages it was clearly seen that lexical material lacks for some languages as used dictionaries of the Yagnobi, Talishi, Gilaki, Yazgulami, and Sarikoli languages had fairly small volume. In addition, it was found that some data contradict one another because of the ancient kinship was superimposed by later linguistic relations on new habitats in Central Asia. Influence of Persian on other Iranian languages is well known, but loan-words from Tajik and Dari were wide present and the ancient Sogdian language had a certain influence on the Pamir languages when Sughdians advanced in the Pamir valleys. Borrowings conditioned by these influences are almost impossible to detect. Thus, the structure of the ancient relations between the Iranian languages is distorted at present and its true appearance cannot be reproduced on the basis of the modern lexicon. However, an approximate version of the lost structure is made effortlessly under certain conventions – if data of some language pairs contradict one other, data of other pairs come to the aid. This is a peculiarity of the graphic-analytical method. The fact that the scheme does not sufficiently reflect the spatial arrangement of some Iranian languages has become apparent when searching for their respective habitats. Given the well-known location of the ancestral homeland, it was clear that the territory, which on the Iranians settled in the subsequent time and which on their common language had been divided, had to be somewhere east of the upper and middle Dnieper. It was here that an attempt was made to place the resulting relationship model. At right: The ancestral home of the Iranians and the direction of migration of Indo-European tribes. The area of the Persian language, located in the very center of the scheme, is bordered by the Oskol and the Seym Rivers. Its south-western border runs along the Seversky Donets River, and further the natural boundary to the Seym River is not clearly seen. At the same time, the areas on both babks of the Psel River are empty. Obviously, these small areas formed dialects that gave rise to some Pamirian languages, akin to Shugnan. Then the area of Gilaki language should be placed between the Seversky Donets, Oskol, and Don Rivers. However, its south-eastern border is difficult to identify, because this depends on the location of the area Mazanderani language, which was not included in the model of relationship due to lack of data. Given the modern habitat of the Mazanderanians, their ancestral home can be assumed to east of the Gilaki area. As the result, it turned out that the so-called "East-Iranian" languages are actually located in the west of Iranian territory and stretch along the left bank of the Dnieper River. 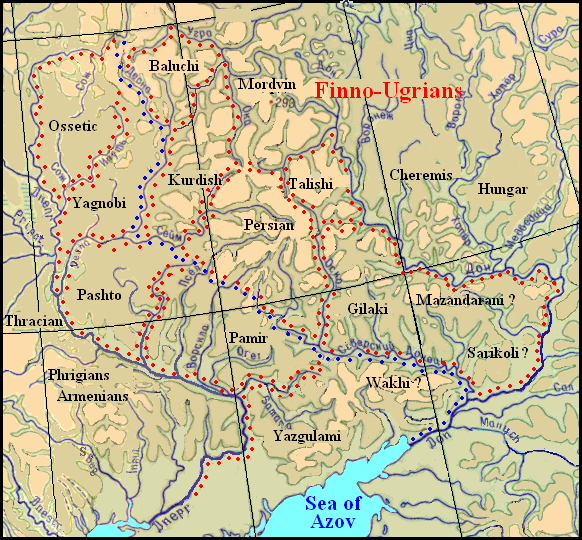 Accordingly, the "West-Iranian" stretched along the left bank of the upper Oka River and the right bank of the Don, in the neighborhood of the Finno-Ugric settlements. Map 5. Settlement territory of the Iranic tribes in the II millennium BC. On the map, the boundaries of the ethno-forming areas are marked with red and blue dots. The blue dots also mark the border between the "western" and "eastern" Iranian languages. Accepted location of the Iranic areas is confirmed by revealing facts of linguage substratum infuence of the previous population. We see, for example, that the area of the Afghan languages (Pashto) is located in the same place where previously the Armenian language was formed. Thus still unexplained matches between these languages are just the result of the impact of the Armenian substrate. More information on this topic is covered in the section "Language substrate". 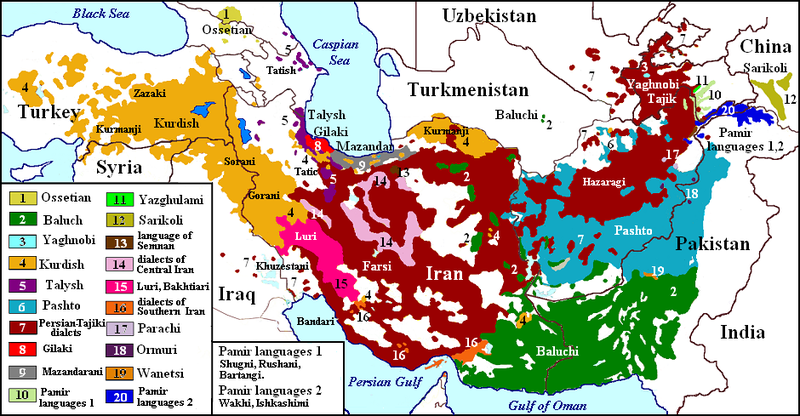 The placing of the area of the Baluchi language in the neighborhood to Vepsian area, based on scant available data about its connections with other Iranic languages, is supported by the presence of common words in the Vepsian and Baluchi languages. For example the Veps word naine “a daughter-in-law” corresponds Bal na'ānē “a daughter" at janaine “a woman". It is clear that the same woman for the Baluchi parents was the daughter and the dauaghter-in-law for the family of her husband. Thus, not only lexical parallels, but such evidence of marriage between the Veps and Baluchis confirms their neighborhood. Maybe Bel pērok "a grandfather" correspons Veps per’eh "family". К. Häkkinen thinks that Fin. paksu, Est. and Veps. paks "thick" were borrowed from Iranian languages but refers only Bel. baz "thick, dense" (HÄKKINEN KAISA. 2007: 860). Of the other Iranian, the similar word is found only in Ossetian – bæz "fat, thick". The ancestors of the Ossetians and Baluchi were neighbors in the ancestral homeland. Lexical material from the Baluchi language is scanty, but the Veps vocabulary was analyzed in comparison with the other Iranic languages. It turned out, that Kurdish had the biggest number of mutual words with Veps – 76, the runner-ups are Ossetic – 65 mutual words, Talishi – 61 words, Gilaki – 56 etc. You can see on the map that areas of the Kurdish and Ossetian languages are closest to the area of the Veps language and linguistic contacts between the populations of these areas also had to be close. Kurd. cirnî “trough” – Veps. kurn “gutter”. Kurd. e'ys "joy" – Veps. ijastus "joy". Kurd. semer “darkness” – Veps. hämär “twilight”, Fin. hämärä "twilight, dusky". The last parallel fits well with the phonology of the Baltic-Finnish languages, which may indicate borrowing Finnish words from Kurdish. In the etymological dictionary of the modern Finnish language, on the contrary, it is stated that the source of borrowing is an Old Germanic word, supposedly represented by Icelandic sámur "dark, dirty" (HÄäKKINEN KAISA. 2007: 238). However, in the authoritative dictionary of Old Norse, the word sámr is considered to be borrowed from the Finnish language (CLEASBY RICHARD, VIGFUSSON GUDBRANd. 1874). The Kurdish and Talishi areas were adjacent to the Mordvinic area. According to this, these languages have the biggest number of mutual words with Mordvinic really (see below). Tal. tyk. "finish" – Mok. t'uk "finish"
Tal. vədə "a child" – Mok. eyde "a child". Kurd ceh "barley" – Mok. chuzh, Erz. shuzh "barley". Pashto cira “a saw” – Alb sharrё “id” (though both can be from Lat cěrra). Alb. kurriz "back" – Yag. gûrk "back". Toch sám "enemy" – Osset son "enemy" (А. Abayev V.I. 1965). Toch witsako "a root" – Osset widag "a root". However, V. Abaev believed that these matches come since the Scythian times, but the Tocharians had already moved to Asia at that time.When the Tocharians left their ancestral home, their habitat was occupied by Baltic tribes, expanding their territory to the Dnieper. At this time, the Baltic language was divided into two dialects – the eastern and western ones. On the territory of the old ancestral home of the Balts west of the Berezina river, the western dialect was formed, which from the Prussian and Yatvingian (Sudovian) languages were developed later, and in the area between the Dnieper and Berezina, the eastern Baltic dialect was formed, from which Lithuanian, Latvian, Zemgalian, and Curonian languages were developed. Thus, the eastern Balts came into direct contact with the ancestors of the Ossetians. Of course, it has affected their language, and certain matches between the Ossetic and East-Baltic languages could be identified. Many of them V.I. Abaev gave in his historical-etymological dictionary of the Ossetic language, but referred them to the Scythian time (A. ABAYEV V.I, 1958-1989), which is also, in principle, possible for some part of them. The stay of the Iranians on their initial habitats, determined by us using the graphic-analytical method, is to a certain extent confirmed by place names. Iranian toponymy in the territory of Ukraine and Russia is in principle quite numerous, but left mainly by the ancestors of modern Kurds and Ossetians and this topic is considered separately. These data are plotted on Google Map (see below). In time some part of the Iranic peoples moved in the direction to Central Asia along the eastern shore of the Caspian Sea and came to the territory of modern Iran at the beginning of the 1st mill BC. Cuneiform sources of that time let know about two groups of Irano-Aryans: Medes and Persians but other Iranis peoples not identified by name had to be somewhere east of them. 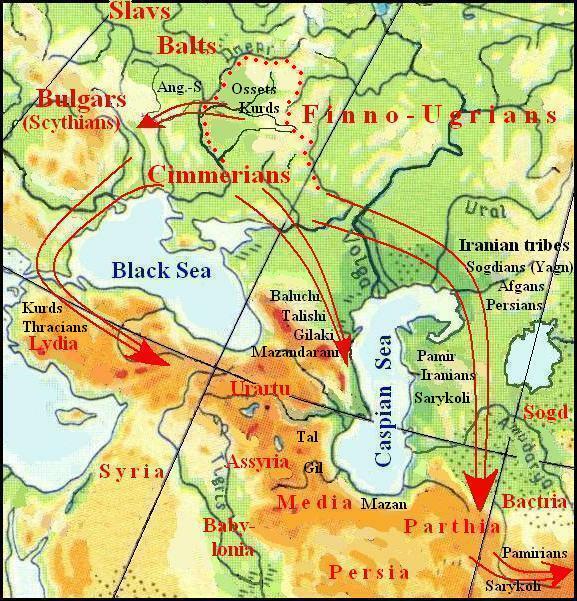 Other Iranic tribes stayed in the Pontic parts. Iranic peoples stay at area of their original home, is to some extent confirmed by place names. Iranic place names in Ukraine and Russia are, in principle, quite numerous, but mostly left by the ancestors of modern Kurds and Ossetians and is discussed separately. Here only results on Google Map.